Melissa Harris-Perry is Presidential Endowed Professor in Politics and International Affairs at Wake Forest University, where she is founding director of the Anna Julia Cooper Center on Gender, Race, and Politics in the South, and Executive Director of the Pro Humanitate Institute. 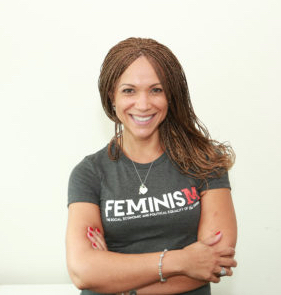 She is the former host of MSNBC’s “Melissa Harris-Perry“. Harris-Perry is author of the well received book, “Sister Citizen: Shame, Stereotypes, and Black Women in America,” which argues that persistent harmful stereotypes-invisible to many but painfully familiar to black women-profoundly shape black women’s politics, contribute to policies that treat them unfairly, and make it difficult for black women to assert their rights in the political arena. Professor Harris-Perry is a columnist for “The Nation” magazine, where she writes a monthly column also titled “Sister Citizen.” She is also a contributing editor to “Essence” magazine where she pens a monthly column on parenting and politics. She also provides expert commentary on U.S. elections, racial issues, religious questions and gender concerns for a variety of other media outlets. Melissa Harris-Perry’s creative and dynamic teaching is also motivated by the practical political and racial issues of our time. She has taught students from grade school to graduate school and has been recognized for her commitment to the classroom as a site of democratic deliberation on race. She travels extensively speaking to colleges, organizations and businesses in the United States and abroad. In 2009 she became the youngest scholar to deliver the W.E.B. Du Bois Lectures at Harvard University. Also in 2009 she delivered the prestigious Ware Lecture, becoming the youngest woman to ever do so. Melissa Harris-Perry also sits on the advisory board for “Chef’s Move!”, a program whose mission is to diversify kitchen management by providing training, experience and mentorship to minority applicants from New Orleans, sending them to New York City for culinary school training and then bringing them back again to become leaders in the kitchen and in their community. For availability and speaker fees, please contact Melissa Harris Perry’s speaking agent at Chartwell here, or call +1 972 385 1021 for U.S. inquiries or +44 207 293 0864 for international inquiries.